FirstSteps was born out of a passion to be part of God's unfolding mission in this world. 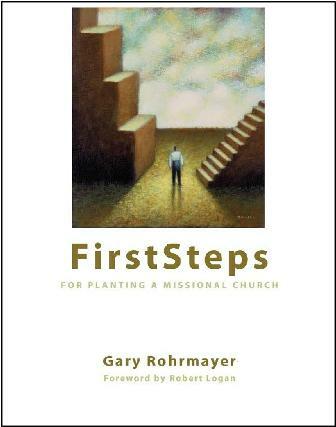 After being involved in over 75 church plants and training hundreds of planter and coaches in these missional concepts through our FirstSteps Seminars, we are proud to offer this complete manual to all who desire to fulfill God's mission through church planting. "The idea of 'steps' is an important concept, because it is a double entendre. The word evokes both movement and foundation ... it explores the idea of moving forward to reproduce churches while being founded and grounded in the glory and mission of God." One of the differences between a follower and a leader is that a leader knows what the next steps are for their organization. Even if they don't know what the actual next steps are they will relentlessly search for ideas, advice and counsel to get their organization to the next level. NextSteps is designed for any church leader who embraces the missional lifestyle the ideas and tools to build healthy church system that allow the church to actualize its values and achieve its mission. 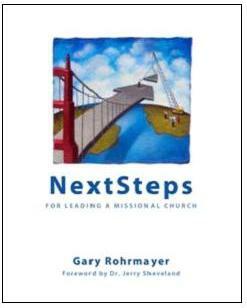 "In this book on Next Steps, Gary Rohrmayer helps church leaders raise up strong missional congregations that are capable of advancing church-planting movements locally and globally. This is a workbook not a book for casual reading. It is written for those whose love for Christ and his church compels them to roll up their sleeves and give themselves to the good work". "One of the most practical books on the subject of church planting I've seen to date. It should be read by every church planter. Tom Nebel and Gary Rohrmayer have the church plantings scares to prove their experience. 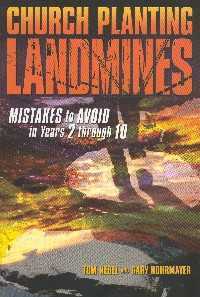 For 15 plus years they have committed their lives to walking with church planters through the minefields they face. This book is their contribution to the larger church planting community because the world needs more new churches that make it. And not only make it but make a significant impact on our communities, our culture and our world." An excellent diagnostic tool to help seekers and believers alike to determine where they are spiritually and to show them how to take the next steps on their spiritual journey. In its seventh printing. For over 15 years Gary Rohrmayer has been developing this tool through personal experience and the training of lay people, pastors, church planters and missionaries. Gary's desire is to help followers of Christ move from a combative approach to evangelism to a more collaborative approach that sustains and cultivates relationships. My friend, Dave Olson, just released a groundbreaking book entitled: The American Church in Crisis. There are many that believe that the American church has been lulled asleep by its own press and endless activities to build itself up. Dave Olson, with his relentless pursuit of truth, offers a wake-up call to a church that has fallen asleep. The American Church in Crisis offers a clarion call to all followers of Jesus to reexamine our motives, methods and mission. In my humble opinion, this will be the most quoted book in the next 5 years. Attendance at American churches is less than half of what the polls report, according to David Olson, director of the American Church Research Project. The American Church in Crisis presents groundbreaking research that offers a more accurate picture of the actual state of the American church at both the national and local levels. The American Church in Crisis delivers unexpected and original insights into both the challenges the church faces and the solutions that will enable the American church to thrive again. Based on the largest-ever research study of American church attendance, yearly data from more than 200,000 individual Christian churches was collected from 1990 - 2006. This unique research base led the author to discover trends and patterns in the American church that were previously unknown. The American Church in Crisis answers the questions church leaders are asking: Why are these trends occurring? What can our church do to reverse its pattern of decline and decay? How can we make the gospel story come alive again to new generations? How must Christian leaders change their values, habits, and priorities for the American church to grow in health and influence? By following a four-step process of observation, evaluation, introspection and action, readers will find hope in the possibility of God rebuilding and restoring his church. The American Church in Crisis offers sidebars, charts, maps, and graphs to give a visual overview of key information. Questions for reflection and discussion help congregations and church leaders take these valuable insights and information, and apply them to their unique situations. Readers will find a richly textured mosaic, with stories of both optimism and challenge. The American Church in Crisis confirms hunches, explodes myths, and offers a clear path toward a brighter future.